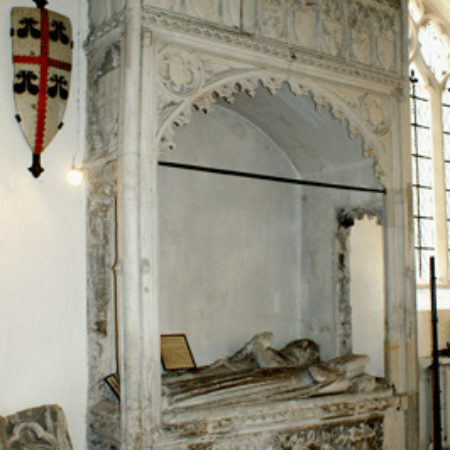 St Andrew’s chapel in the south aisle of the church contains the freestone effigies of a knight and lady installed beneath a tall, heraldic canopy with matching ‘tomb-chest’ panels. The canopy, described by Pevsner as ‘of a chaste, rather frigid design’, has a row of seven pendant shields above the arch, an upper register of small shields around the cornice, and singles set in the arch spandrels. 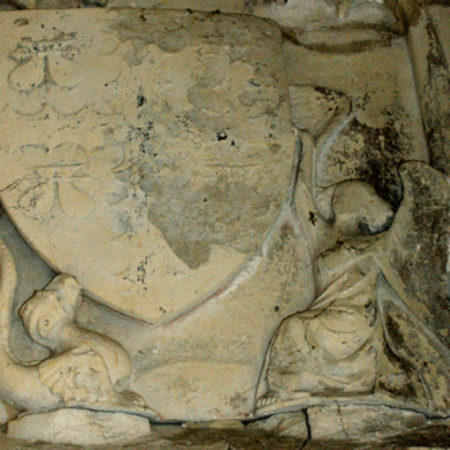 The canopy and ‘tomb-chest’ are executed in chalk (commonly called clunch), a relatively soft stone, and the heraldic content is lost except for the single, large shields on the east and west sides of the canopy. Both display a cross engrailed between four water-bouchets (buckets), for Bourchier. The north-east ‘tomb-chest’ panel contains an angel and shell, the latter thought to be a rebus for the Coggeshall family. 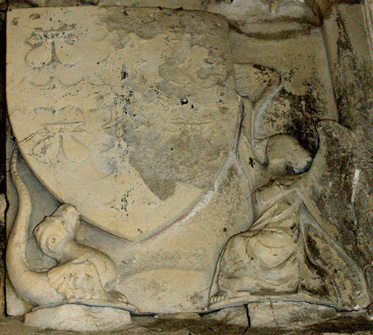 In the absence of an epitaph and further heraldry, the juxtaposition of the shell and Bourchier arms is the basis of the traditional identification of the effigies as those of John Bourchier, second Lord Bourchier (d. 1400), and his wife, Elizabeth Coggeshall. John Bourchier was the son of Robert, Lord Bourchier (d. 1349), a confidant of Edward III who fought at Crécy (1346) and was briefly chancellor of England (1340-1). John served in France during the 1350s and 60s, was captive from 1372 to1378, and later made governor of Flanders (1384) and Knight of the Garter (1399). In 1341 Robert received a licence to found a college in the town of Halstead of eight chaplains, and to secure land and rent worth 20 marks p.a. ‘out of the abundance of the king’s affections’. In 1412 a licence was granted to Robert de Clifford, bishop of London and several local landowners to found a college of five chaplains in Halstead church to pray for the souls of Robert and John Bourchier and their wives, called ‘Bourghchiereschantrie’. The college was to be endowed with 702 acres of land, 71 acres of pasture, 57 acres of wood, 29 acres of meadow, rental income of £5 13s. 6d. a year, and the living of the nearby church of Sible Hedingham in the manor of the first lord’s wife, Margaret Preyers. The male figure has a helm headrest with Saracen’s head crest, and originally had the Bourchier arms carved in low relief on its chest. The mitten gauntlets are unusual. The lady wears a gown, mantle and distinctive nebuly headdress, and has twin dogs as footrest. Traces of red colour on the hem of the lady’s robe suggest the carvings were brightly painted. The treatment of both effigies is formulaic: the armour of the male figure is typical of the period 1370-1400, while the nebuly headdress first appeared in English funerary monuments as early as the 1360s. The costume evidence, therefore, does not provide conclusive proof of the identity of the effigies, which may in any case have been commissioned during Robert Bourchier’s lifetime. The canopy and ‘tomb-chest’ appear to date from the mid- to late-fifteenth century, and may not belong. They were installed with the effigies before 1629, when the monument was drawn by an unnamed herald. At least two other Bourchier monuments lie nearby. Immediately to the east are the effigies of a knight and lady carved from a single slab, together with fragments of a tomb chest. 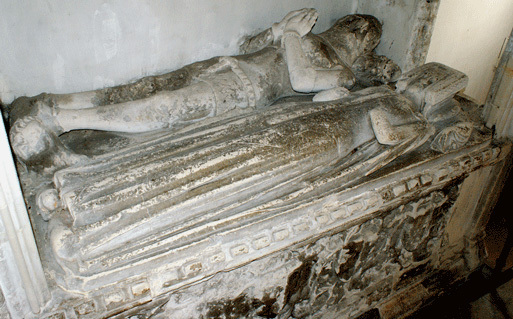 The knight’s armour and the v-shaped folds of the lady’s robes suggest the effigies date from before 1320. 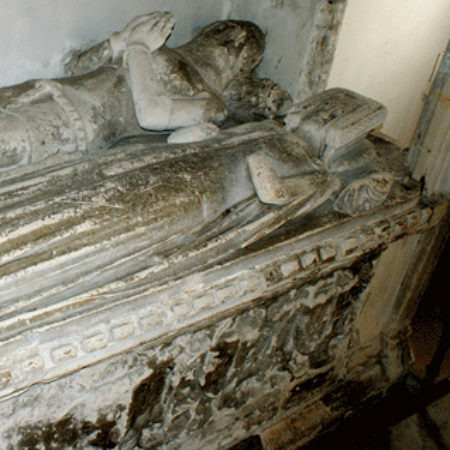 They may those of the first lord’s parents, John de Bourchier (d. 1329) and Helen of Colchester, or indeed his grandparents, Sir Robert de Burser (d. 1301) and Emma. The tomb-chest fragments feature mourners and pendant shields within quatrefoils, and do not belong to the effigies, for the original tomb-chest was significantly longer than the effigy slab. The shields probably served to identify the mourners as well as the deceased. The surviving arms are Bourchier and Munchensy, the latter a reference to Helen of Colchester, daughter of Joan de Munchensy of Stansted Hall. The third Bourchier monument, lying to the north of the altar of St Andrew, is the brass of Barthlomew, Lord Bourchier (d. 1409) and his two wives, Margaret Sutton (left) and Idonea Lovey (right), made by the London ‘B’ workshop. 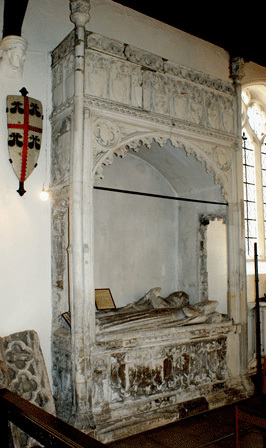 Bartholomew was the son of the second lord Bourchier, and the last senior Bourchier to be buried at Halstead. In 1631 the antiquarian John Weever recorded that a chapel stood on the south side of the Halstead ‘Quire’ called ‘Bowser’s Chapell’ housing a number of Bourchier monuments, including that of the first lord. It is not clear whether Weever meant the present chapel or the south side of the Halstead chancel; whatever their original position all of the present monuments have been moved and modified. Most of the displacement took place during the eighteenth century, a period which saw widespread remodelling of the east end of churches, great and small, and the displacement of medieval monuments. The first lord’s tomb was all but destroyed by 1806 when the Rev. D. T. Powell sketched fragments of his effigy. Powell also recorded that the twin effigy slab in the south-east corner of the chapel had been inverted, lowered into the chancel floor, and used as pavement. The canopy above the effigies of the second lord and his wife shows extensive signs of reconstruction, and has lost the foliate cusping of the cornice and the micro-vault beneath its arch. Bartholomew Bourchier’s brass was originally installed on a panelled heraldic tomb-chest, also lost. 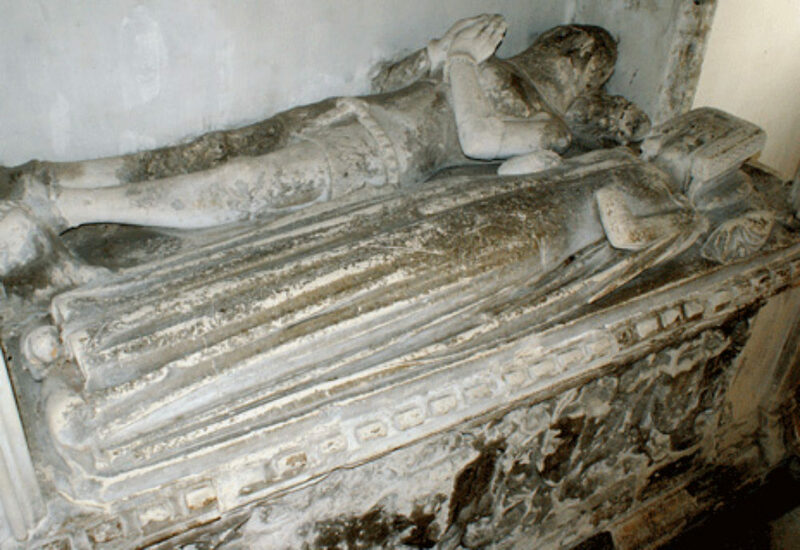 The Halstead medieval monuments belong to a broader group of Bourchier tombs housed in a number of English churches, including those of Eleanor, Lady Bourchier (d. 1397) at Little Easton; Henry Bourchier, earl of Essex (d. 1483) at Little Easton, originally at Beeleigh Abbey, near Maldon; Elizabeth, Lady Robessart (d.1433) at Westminster Abbey, and Thomas Bourchier, archbishop of Canterbury (d.1486), in Canterbury Cathedral. Their number and geographical diversity is testimony to the aggrandisement of this Essex gentry family. There are also exemplars for a common theme in the understanding of medieval church monuments: what we see today is often far from what was intended.